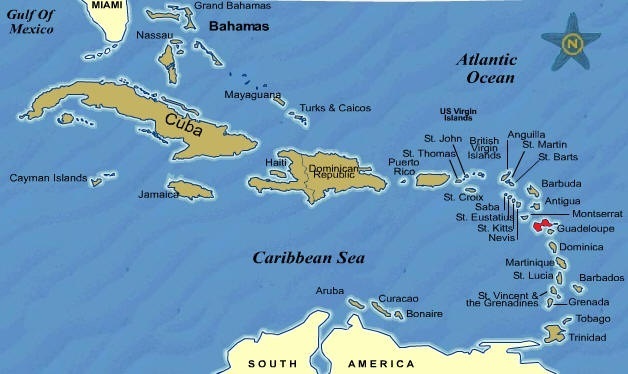 CLIMATE : This Caribbean island is in the tropical zone and is a perfect holiday destination. The year-round average temperature is 28°C. The climate of the island is tropical and there are only two seasons. From mid-July to mid-November there is the Hivernage when there are high temperatures and higher rainfall with typical tropical cloud cover which can disappear as quickly as it came, and air temperatures of around 30°C and sea temperature of 28°C. The second season, Careme, is a dry season which lasts from December until mid-July with air temperatures of around 27 ° C and sea temperature of 28 ° C. Thanks to trade winds and the local Alize wind, which cools the tropical air all year round, there is very pleasant, refreshing and warm weather. Guadeloupe is an economically advanced French island which is a part of the European Union, and visitors to the island face no health or safety risks. Water sports such as surfing, kiteboarding, windsurfing, sailing, jetski, diving, snorkelling and fishing are very popular and are practiced all year round. You can also play golf and go horse riding, all on one of the most beautiful Caribbean islands. Flight connections: from Paris to Guadeloupe - International airport Pointe a Pitre (PTP). Flight time is 8 hours. 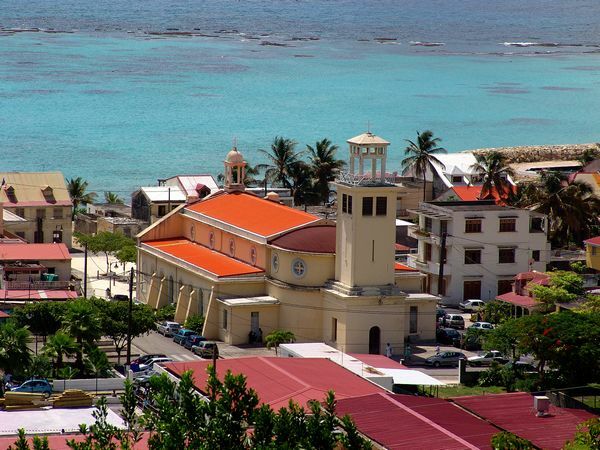 St Anne is a beautiful small town on the Atlantic coast with white sand beaches and coconut palms. Just 30 km from the airport, it is a pleasure for all the family. Spots in Ste-Anne tens of meters from the beaches create perfect conditions for surfing in waves suitable for beginners and advanced surfers alike. This small picturesque town has everything a family might need : Supermarkets, souvenir shops, local market, banks, post office, restaurants, disco and night clubs, car rental agency, sporting goods hire shops, doctors and a clinic. Experience magical and unforgettable moments during this memorable day on board the high-comfort catamaran sail boat with its friendly, relaxed atmosphere. Admire the beauty of the wild islands of Petite Terre, an official nature reserve, and enjoy a barbeque lunch served to you on the beach in the shade of a large tent, with grilled fish on the menu. At your disposition are also fins, masks and tubas for exploring the seabeds around the islands, and after the meal, you can relax, swim or wander on foot around these untamed islands. Set off to explore Basse Terre on board the legendary 4x4 Land Rover Defender. For more than 15 years, Safaricaraibe, pioneers in discovery-tour organisations, have offered day excursions in Land Rovers to the great enjoyment of travellers wanting to explore an authentic Guadeloupe off the beaten path and to experience the 1001 wonders the island has to offer. Tour the luxurious tropical forests and swim in the waterfalls and in the waters of some of the most exotic beaches of the Carribean coast. Drive past sugar cane plantations and through tiny fishing villages, having lunch in the homes of locals. Journey through banana and pineapple fields and bathe in the natural jacuzzi of the hot water springs, or discover the Carbet waterfalls and the mountain range of La Soufriere, the volcano. Finally, you can dine by the seafront with a view of the islands of Les Saintes. A circuit between sea and sky, contrasts between green valleys and lowlands, fields of sugar cane, a visit to the Damoiseau distillery, vast stretches of savage coastline, and the impressive cliffs of the Northermost point. Bathing at a beach made of coral sand, Ti Punch with your feet in the water and a picnic. The bay of Les Saintes is considered one of the most beautiful bays in the world. Here you can visit the Napoleonic Fort, with its panoramic views, admire the Saintoise traditional wooden homes, known as cases, or explore the town of Terre de Haut. Relax on fine sand beaches, or head towards volcanic hilltops of Pain de Sucre and enjoy a traditional Creole meal. Distinguished by its endless stretches of golden beaches leading down to a sea of marvellous shades of turquoise, sail and fish your way around this island enjoying refreshing drinks as you go. Scuba diving or beginner diving courses are available, or you can explore the old distillery of the island and taste the local rum. Discover the château Murat, the botanical garden or the active mill of Moulin Bezard, or, for ultimate relaxation, enjoy a traditional meal and open bar on the beach. Cross the bay of Point-a-Pitre and make your way up the Riviere Salée, with its mangroves and trees. 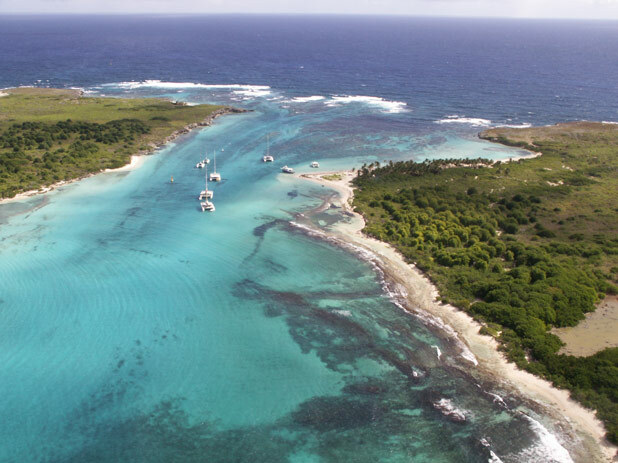 Discover the Caraibe lagoon, and swim around the barrier reef behind Ilet Fajou. Relax on Ilet Caret or dine on Ilet la Biche in an authentic fisherman’s cabin. 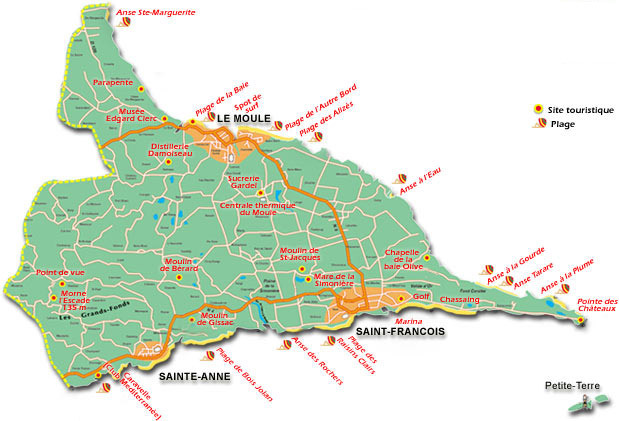 As you make your way back, explore Ilet aux Ouiseaux. Hot meals, drinks, fins, masks and tubas all provided.